Hi everyone! How are you? I have been left this blog untouched for about a week. Sorry for that ... but now I'm back to post again. I have been busy with my son at home from last Monday. After 4 days fever, now he is okay but still needs a lot of rest. He will go back to school on Thursday. Two blood tests done for him came out nothing worrying except his haemoglobine and leucocyte dropped. We are still waiting for the other blood test called Gall Culture. This blood test result takes about 1 week. So we will able to have the blood test result this Thursday and consult with the doctor if there is anything wrong (hope and pray nothing serious). That is why I didn't send him to school for a week. He has been diagnosed by doctor to have bronchitis. So he has to have inhalation 3 times a day with a lot of medicines to eat. Luckily, we have a nebulizer at home so we can conduct the inhalation by ourselves without going back and forward to the hospital. So today, I managed to make bento for my girl. Please use your imagination to imagine that those 2 animals are the moles :p They were cut by hand using my X-acto knive. The whiskers were from dry somen. I think dry somen is perfect because it is thinner than dry spaghetti. Inside the red round box (1st tier) : rice at the bottom, pork mince cooked with sweet soy sauce and onion, crab stick flowers, and chopped cucumber. Inside the pink round box (2nd tier) : oranges, strawberries, green tomatoes, and stir fry carrot & cabbage with scrambled egg. Awww... poor Andrew! I hope he is feeling much better now with mommy's TLC! rice with porky fried with soy sauce onion and all sounds so yummy! simple and nice. And I love your moles! Miss your post so much and so glad that you are back. Will be praying for your son's speedy recovery and a good blood test result. Your moles are done very well...cute! The bento is so lovely! I love the 2 tier round bento. Sending best wishes to Andrew! I'm sure he'll be back to to his energetic self soon! I love your moles! At first glance, I thought they were birds, but on better inspection, they look just like cute little moles! I hope your son feels better soon! I love all your bentos and I hope that I will be able to make them when I'm a mother! Very glad that Andrew's feeling better, am sure your whole family is very relieved too! @Sarah : hahaha ... They do look like birds if you have a quick look :D The moles are under cover. I'm sure you can do your bento and actually you don't have to wait until you become a mother. You can start now and prepare your own lunch. Thanks a lot for your comment Sarah! At first I thought they were ducklings..but after i saw the nose and whiskers.. i knew they are moles. Adorable! Hope your boy is fine now. Kids nowadays easily have bronchitis.. i dont know why, is it the pollution in the air. My boy has to be neubalised quite a few times from age 1 to 2,and i have the inhaler set at home too.. Darling little moles in their holes... I couldn't comment this morning on my BB! So annoying! But want to tell you that I hope all your friends' support here help diminish the worry for Andrew, and that the tests reveal no problems. Take care all of you Lia! Yes, they do look like moles, very cute. My mom in law just got bronchitis 2 weeks ago. We thought she would get a hearth attack since the symptom was like one. We rushed her to the emergency room. As a bento beginner, can i ask what is the diff btw the x-acto knife and normal penknife? where can i get it? trust your boy is fine now. Miss u so much... glad that u r back again to share your nice bento with us. @ SIG : Thanks a lot! @Vanessa : I totally make some of you confused with the moles ... So let's pretend the moles can shape shifting LOL :D Thanks Vanessa! @pigpigscorner : Thanks a lot! I seriously love these moles, they are adorable! What a perfect box for a little girl, F would love it. Beautiful bento as usual :)! Hope your son is going to get well soon! @Cooking Gallery : Thanks a lot! 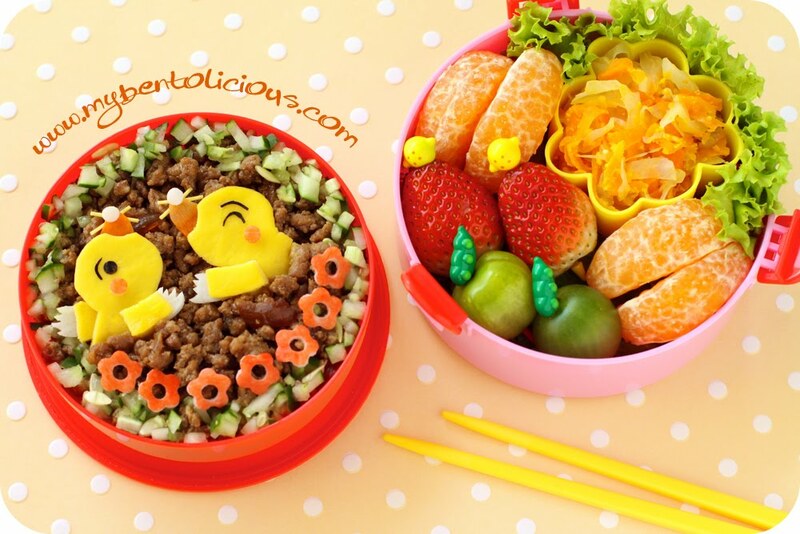 oh noooo, ur bento looks yummylicious!!! @Aris Munandar : Thanks a lot Aris!